The end of my reading challenge is almost in sight, I'm currently onto 45 books out of my target of 50, so it'll be a close one! 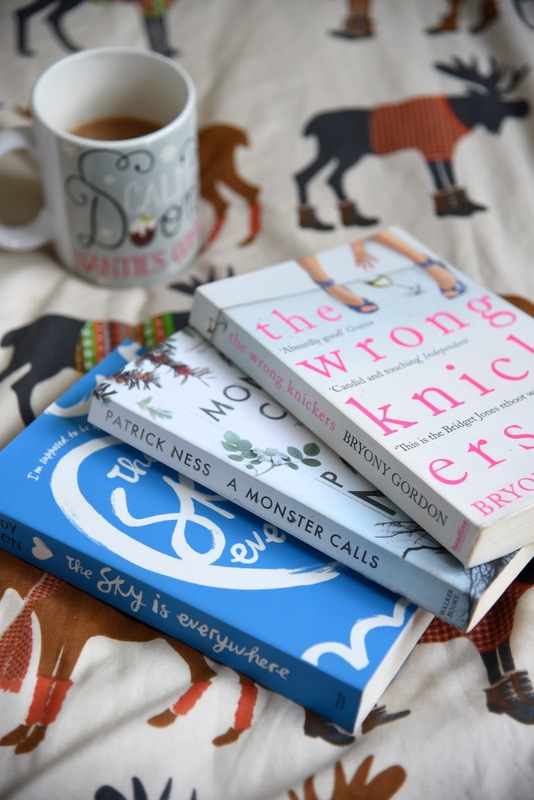 Here's a little round up of the last 3 books I read! This book is all about Bryony's exploits as a twenty something year old living in London, this is honestly one of the funniest books I've ever read, I was actually laughing out loud! Her writing is absolutely hilarious and some of the things she gets up to are so so funny. If you're looking for a funny read I'd highly recommend this! Set around Conor, who feels himself getting lost in life ever since his mum became poorly, begins to have the same dream every night, being visited by an ancient monster, who wants Conor to admit truths about his life. This book is really well written, the story is really heart-wrenching. It's an emotional book but the story is a really important one and it's a great read. Seventeen year old Lennie was used to growing up in her sister Bailey's shadow, until one day Bailey unexpectedly dies, Lennie is forced to take centre stage in her own life. I found this book really interesting, the characters and scenes were set very well. I liked the little scribbles in-between chapters and you really felt like you were involved in the story. Emotional at times but also filled with light it's a really good read. I absolutely loved the sky is everywhere by jandy nelson!